13-year-old Brit Tim Parker was named the Fastest Kid in the World, earlier this month, at the Kent-based (and unfortunately named) HPV Championships—which, in this case, stands for Human Powered Vehicle. Representing the Penair School, Parker competed against kids as old as 16, racing vehicles powered solely by their own brute force. Tim Parker, in his low-riding three-wheel pedacycle, reached speeds of 30mph! 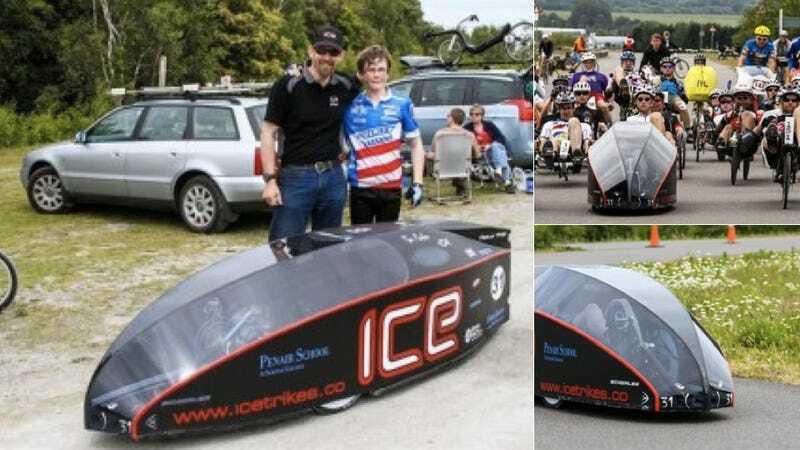 His trike, house within a an aerodynamic bullet-like shell, was created by the Falmouth-based Ice Trikes—where Tim's father Chris is director.